I should have written further details about my gingerbread church!! The top of the steeple is covered in sliced almonds. The roof is covered in wheat chex. There are melted jolly rancher stained glass windows, and sugar cone pine trees. The path to the red door is chopped pecans. All of the piping is royal icing. The only issue I had was with our high humidity at the time of decorating. The dough recipe I used softened up with the humidity (even though it was a "construction" type of dough), so the heavy steeple made the roof begin to sad. Yikes! 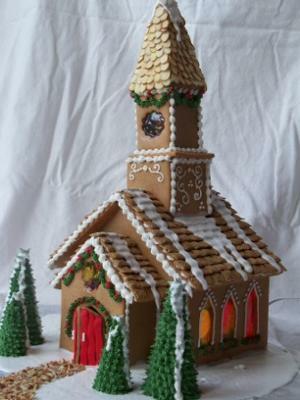 Next time I make this I will take precautions and add a support wall beneath the roof where the steeple will rest. That ought to give further support. The high humidity also caused the jolly rancher candies to "weep" and drip. Does anyone have any ideas about this? ?